I’m so excited! I invented a completely new dessert. Seriously. Go Google it. Well, print it first. Then Google it. (haha). It didn’t exist before me. 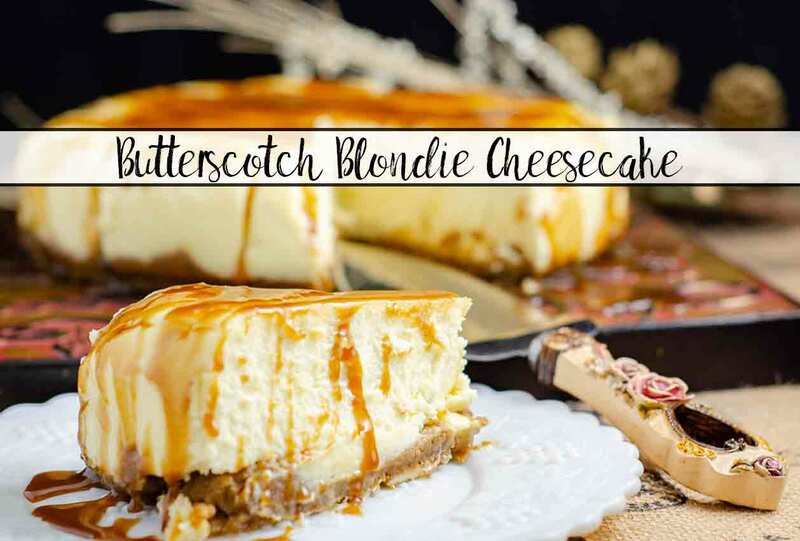 I proudly introduce: Butterscotch Blondie Cheesecake. A blondie crust. A delicious cheesecake with my own special twist. Homemade salted bourbon butterscotch sauce. Each delicious on their own, combined they are fabulous. You have no idea the testing and adjustments that went into this recipe. I’ve been working on this over a year. I have a clipboard full of various versions of the crust, cheesecake, and butterscotch. But perfection has been achieved. The saga of the butterscotch alone is a mighty tale (haha). In developing butterscotch, I posted on StackExchange, Reddit, and Facebook to get opinions. What counts as butterscotch? You wouldn’t think this would be such a passionate issue. But people got passionate. The purists claimed that it could only contain dark brown sugar, butter, and (maybe) heavy cream. But that was a bit ‘blah.’ Okay, more than a bit. The second class claimed you could mix in ONE additional thing and it would still be butterscotch. Nope, didn’t work. I finally left the purists behind and started experimenting. The salted bourbon butterscotch sauce below is good enough to eat with a spoon. But why do that when you can smother it over a blondie cheesecake? Blondie crust, delicious cheesecake with a special twist, homemade salted bourbon butterscotch sauce. Pre-heat the oven to 325°. Place sugar in 9"x13" glass pan. Place in oven. Bake for 2 hours, until it darkens to sandy tan color with a coarse texture, stirring every 30 minutes. Be very careful! Despite looking like cool sugar, it reaches a high temperature. Removed from oven. Allow to cool completely. Store in airtight container at room temperature (just like regular sugar). Preheat oven to 350°. Next, we're going to make the pan waterproof since the cheesecake will bake in a water bath. Lightly grease the inside cheesecake pan. Take a piece of parchment paper. Cut a circle with 2" excess (larger than the bottom of the pan) on each side. Press parchment paper into the bottom and up the sides of the pan. Lay out a large piece of extra-wide foil. Place pan in the middle. Fold the foil up all sides. Crimp the excess at the top. Mix the flour, baking powder, salt, and baking soda in a medium bowl. Set aside. Whip the softened butter and brown sugar until well-mixed and slightly light and fluffy. Slowly add flour while blending on low speed after each addition. Press mixture into the bottom of the cheesecake pan. (It will be sticky). Don't worry if it's not 100% even...it will settle slightly as it bakes. Bake in oven for 10 minutes. (It won't be completely done cooking, we're just prepping it). Remove from oven and let cool. Turn oven down to 300°. Place a large roasting pan in oven. Set a large pot of water on the stove and bring it to a boil while making cheesecake. Cut cream cheese into chunks and place in stand mixer. Beat on medium to medium-high speed for approximately 4 minutes, until absolutely no lumps and well whipped. Scrape down. Add sugar and salt. Beat another 2 minutes. Scrape down. From this point forward, treat the mixture gently and only mix on lower speeds. Add eggs one at a time, blending on slow speed after each addition. Scrape down. Blend in sour cream, heavy cream, and vanilla. Mix until smooth. Scrape down. Mix on low speed an additional 2 minutes. Pour cheesecake into pan over prepared crust. Place cheesecake in large pre-heated roasting pan. Carefully pour boiling water around the cheesecake pan into the roasting pan. (Water bath for the cheesecake). Add until water reached approximately half-ways up the pan. Cook for 1 & 1/2 hours. Turn the oven off and prop open the door about half-ways. Allow to sit in slowly cooling oven another hour. Remove from oven and place on counter. Remove tin foil. Allow to cool completely. Place in fridge and chill overnight. In a medium saucepan, bring the butter, sugar, cream, and dark corn syrup to a boil over medium heat. Lower heat and simmer gently for 10 minutes, stirring about once a minute. Do NOT stir constantly. When it's done, there should be no graininess left. Test by pressing a spoon with a small bit of sauce and scrape against a plate. Remove from heat. Stir in bourbon. (It will bubble! This is normal). Keep stirring and let alcohol burn off. Stir in vanilla and salt. Allow to cool. Remove cheesecake from fridge. Carefully snap open cheesecake pan. Remove sides. Place plate on top of cheesecake. Flip over. Remove bottom of pan and parchment paper. Place plate on bottom of cheesecake. Flip again. Remove top plate. 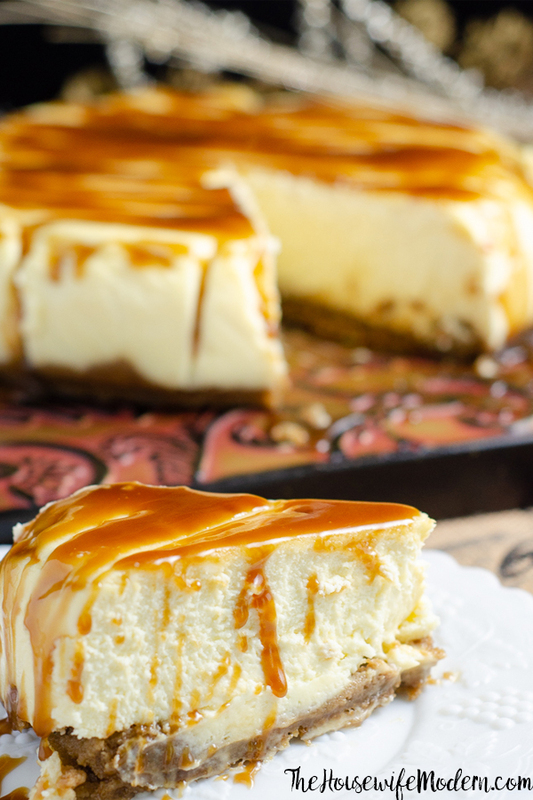 Serve with a generous amount of butterscotch sauce poured over the top. **There will be extra roasted sugar. I haven't tested with roasting smaller amounts. You can use this roasted sugar in any recipe that calls for regular sugar. It will give it a slight caramelized flavor. **This is an overnight dessert. The cheesecake has to cool in the fridge overnight for the best flavor. 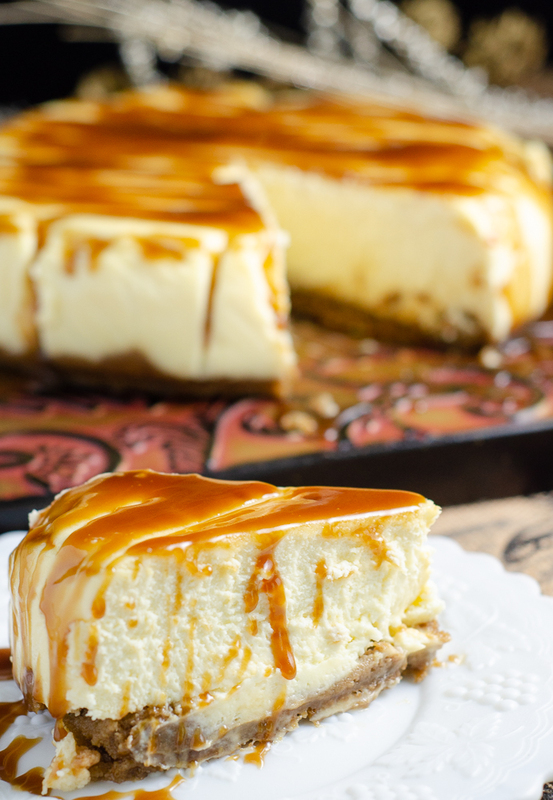 This cheesecake and sauce looks absolutely delicious! The photography is great! Great job! Thank you! I was so happy with how the photos turned out. Hopefully I can get past page 3 on Foodgawker. Oh wow! This looks amazing. Everything about it looks delicious. Thank you! You wouldn’t believe how many crusts, cheesecakes, and butterscotch varieties my poor husband had to taste-test before I settled on the perfect combination. 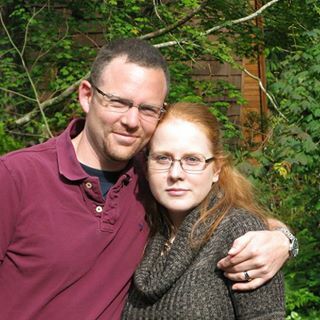 Though husband wasn’t complaining…haha. YUM! This cheesecake looks absolutely perfect! I love butterscotch anything and will definitely try this recipe soon! That looks amazing. I love cheesecake, in fact I would choose it over cake any day. I even have a pinterest board just for cheesecakes called Cheesecake Obsession. I drool over it often. I will be pinning this one to it. The second I read salted bourbon caramel sauce, you had me HOOKED. It looks and sounds so delicious! Thank you! I tried a lot of butterscotch combinations before I settled on the Salted Bourbon Butterscotch Sauce. Though the testing was (mostly) fun! haha. This cheesecake looks amazing! Can’t wait to try! Oh my hat … this is my new favourite dessert, and I’ve never even tried it 😁It looks incredible!